Product #22056 | SKU SFG1UX2/TQ | 0.0 (no ratings yet) Thanks for your rating! 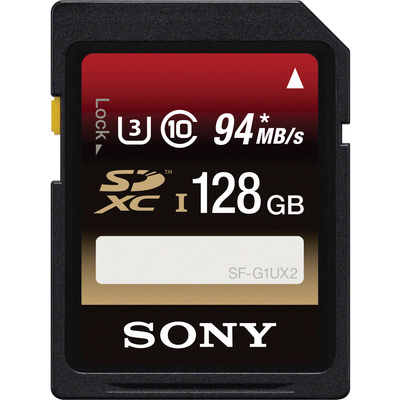 Capture 4K video with the 128GB High Speed UHS-I SDXC U3 Memory Card from Sony . This SDXC memory card comes compatible with the UHS Speed Class 3 rating denoting a minimum data read speed of 30 MB/s which is sufficient for capturing 4K content as well as high speed burst mode photos. With a maximum data read speed of up to 94 MB/s and maximum write speed of up to 70 MB/s you can transfer even large files to and from the card quickly. This card also comes with downloadable File Rescue Software to help recover your photos and videos should they become damaged or accidentally deleted. With a maximum data read speeds of up to 94 MB/s and write speed of up to 70 MB/s you can transfer even large files quickly. This SDXC memory card is designed for 4K video shooting, high speed burst shooting, and fast transfer speeds. The included downloadable File Rescue Software helps recover photos and videos that have been accidentally damaged or deleted. You can even recover 3D and HD files. This memory card comes waterproof, dust-proof, temperature proof, and guards against both UV and static allowing you to shoot with ease.